I haven't read a book that takes place in a drama club in forever! I love plays and the idea of on and off-stage drama. I also really love reading books based around close friend groups and then you add in the forbidden love and life-altering accusations and this sounds like it is going to be a great contemporary! 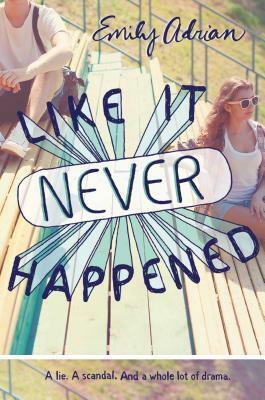 The cover for like it never happened is so pretty. I know right? I love how they did the lettering. Thanks for following! I will head over to check out your blog. Love the cover of this one! Sounds like a good contemp fiction! Great pick! I haven't read a lot of contemporary lately but that usually changes in the summer! Great pick! I hope you enjoy it!